Over the past two years, the use of social media in business has increased. After 23 years of investing in TV ads for the Superbowl, Pepsi dropped the Superbowl ads in 2010, and instead, invested in a $20-million social media campaign. Best Buy has over 2500 employees helping customers as part of their Twelpforce initiative. That being said, social media is very time-consuming. A couple of years ago, we saw the emergence of tools made for automating social media. Automating social media takes away the human side of it, which is what really matters. “Social media is most effective when it’s centered around creating lasting relationships with people,” says Barone. She goes on to explain that the goal of social media is to take part in conversations. Therefore, automating conversations is not recommended. However, it’s ok to automate tasks (as opposed to interactions.) For example, occasionally setting an auto-tweet or Facebook update to announce that you have published a new blog post. 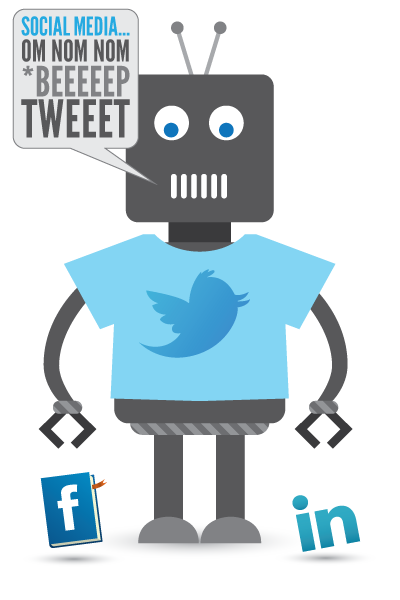 OneDesk’s automation engine allows you to automatically reply to social media. This means that whenever someone Tweets, Facebooks, or mentions you in a blog or blog comment, the automation system will send a response from your social media accounts. Just like Barone, we also do not recommend automating every single social media process. Rather, use OneDesk’s automation engine to acknowledge receipt of all the social media comments you receive. Thank your customers for reaching out to you, and assure them that you will follow-up with them at a later time. I’m with you both when it comes to social media automation – where one must do it responsibly. In a good way, social media automation can save you time from the non-productive work of posting news on your niche that your peers may find interesting – so you can use that time saved in focusing on real conversations with them instead. If you ask me, I took Pareto’s principle into a whole new approach, where I’m following the 80/20 rule of social media marketing: as in 80% conversation and 20% automation. I guess, everything’s a chain reaction of events– and social media automation tools can help alleviate the woes of social media fatigue. Besides, the point of getting social online is to engage and have fun doing so, isn’t it? Thanks for sharing your thoughts with us, Aaron! That’s right, engaging with your community can be a lot of fun. It’s also one of the best ways to learn about your brand, products, industry and even competitors. We sure would like to see more people following the 80/20 rule.